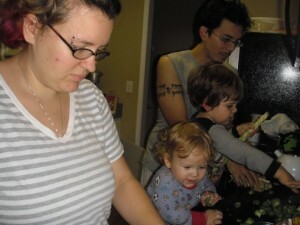 It’s easier to cook when our children aren’t in the way. Bubbling pots and sharp knives, after all, are hardly child-friendly, but the kitchen shouldn’t be off-limits to kids. But how much, really, do our beloved children benefit from a steady schedule of, well, scheduled activities? We tend to forget that ordinary activities, such as cooking together, can be flexible, hands-on, purposeful experiences too. 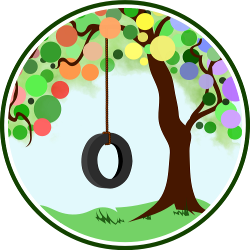 As they snip, read, and converse with us, our kids are learning physical, mental, and social skills. Here’s how cooking can be educational for them. Even a baby in an infant seat benefits from time in the kitchen. She pays attention to your actions. She’s delighted when you talk to her and show her what you’re doing. Due to mirror neurons in our brains, all of us mentally duplicate actions and emotions we see. This inborn way of learning means that we’re continually participating in what we observe. Your baby’s mirror neurons allow her to vicariously experience what you’re doing. As she sees you wash, peel, and cut carrots, she’ll form a mental template for that task, essentially allowing her to practice in advance. If you change an element of that familiar activity — perhaps by using garden-fresh carrots with long waving fronds instead of milled carrots from a plastic bag — your little one will pay heightened attention. If your knife slips and you cut yourself, she’ll react to your surprise and pain, making her understanding of sharp implements more real than any warning might accomplish. Young children clamor to be included. When a preschooler begs to help prepare dinner, he doesn’t want to play with a toy cooking set; he wants to participate in the real work that’s taking place. It slows us down to let him cut fresh mushrooms with a butter knife (and restraint to avoid criticizing or re-cutting), but your child recognizes his contribution toward dinner. He’s also more likely to eat it. Research has shown that children who participated in household tasks starting at age three or four were more likely to succeed in adulthood.1 I’m talking about educational completion, career success, and good relationships with family and friends. Even I.Q. scores had a weaker correlation with success than giving children early responsibilities. And waiting until children were older tended to backfire. We spend much time and money on enriching activities and products for our children, but if they don’t get the chance to take on real responsibilities, we’re depriving them of key components of adult competency. Kitchen-related tasks allow our children to learn more than how dry pinto beans are transformed into enticing re-fried beans. Kids begin to see scientific principles at work. They develop personal qualities such as patience. They are motivated to apply what they’re learning to more challenging endeavors. Sure, it doesn’t hurt to know what it takes to grow the tomatoes, make the sauce, and prepare the beans for tonight’s bean enchiladas. But more importantly, as our children become proficient in the kitchen, they also see themselves as capable learners. That perception transfers across all endeavors. Full sensory learning has staying power. Apart from nature, it’s hard to find a more sensory-rich environment than the kitchen. As your child’s little fingers crumble blue cheese into dressing, add raisins to a measuring cup, or tear mint leaves for chutney, the tactile and olfactory pleasure help encode specific memories. Perhaps the happiness your daughter feels making mint chutney with you today will be evoked each time she smells mint in the future. We humans must see, hear, smell, touch, and, yes, taste to form the complex associations that make up true comprehension. Childhood is a period of major neuroplasticity, when learning actually changes the brain’s functional anatomy. Hands-on experiences are particularly vital at this time. 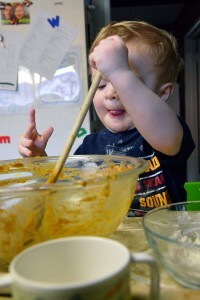 In fact, the child who spends plenty of time with manipulatives (arranging cookies on a platter, sifting flour, washing silverware) and using real-world math (measuring ingredients, counting celery stalks, following recipes) has a strong foundation of representational experience, which in turn enables better understanding of abstract mathematical concepts. These hands-on experiences also contribute to reading readiness. Another benefit of kitchen learning? Cooking and tasting the results a short time later provides wonderful lessons in cause and effect. Children accustomed to blinking, beeping toys and rapidly changing screen images may become so wired to this overstimulation that without it, they’re bored. The slower pace of kitchen conversation and cooking tasks can be an important antidote, especially when we’re willing to go at a child’s pace. Young children tend to balk when they’re hurried. They show us, stubbornly and often loudly, that there’s nothing more important to them than the here and now. So whenever possible, simplify so you can make your time together in the kitchen enjoyable. Slowing down is better for digestion, concentration, and overall happiness. Letting a small child spread his own peanut butter, cut his own sandwich, and pour milk from a tiny pitcher into his cup is a way of affirming the value of the present moment. It also makes for an effortless tea party. There’s no denying that children who help out in the kitchen pick up useful skills. They learn that a cake takes lots of mixing, but muffins very little. They can set the table, toss a salad, make a sandwich, and boil pasta. Not right away, but eventually. They also learn from the examples we show them, such as how to handle pressure and ways to learn from mistakes. Whether we’re four years old or forty years old, gaining competency feels good. It doesn’t hurt to give credit where it’s due. So if your child has been busy peeling potatoes and crumbling bacon, try renaming the entrée “Max’s special potato soup” for extra reinforcement. When we prepare a family meal, bake a cake to celebrate a friend’s good news, or change a favorite recipe to accommodate Grandpa’s diabetes, our efforts have noticeable value. As our children participate along with us, they feel that same satisfaction. So many educational tasks put before our children serve no purpose other than to instruct. But when learning is connected to something truly purposeful, it can’t help but spark enthusiasm. Children feel honored to be included in real work that includes real challenges. If we pay attention, we’ll see that’s just what they pretend to do when they play. Even toddlers can help. Let small children cut mushrooms, pears, bananas, and other soft items with a blunt knife. Encourage them to stir (as long as you or they hold the bowl). They’ll be happy to add ingredients, tear lettuces, and grate cheese. When putting together forgiving dishes like soups or casseroles, have them help you choose herbs and spices by smell before you toss in a pinch or two. Encourage your small fry to wash unbreakable items in a sink of warm soapy water. Let them clean up crumbs on the floor with a small whisk broom or hand-held vacuum. Put them in charge of setting out napkins on the table and calling family members to dinner. Give them the job of stacking unbreakable containers in a low cabinet. Solicit their opinions on aroma, taste, and appearance as you cook together. And remember to thank them for their assistance. As they get older, children can read recipes, plan meals, and do nearly every task required to make the dishes they enjoy. The time will come when they won’t want you in the room explaining how to fix a lumpy cream sauce or talking about how Nana always mixed pastry dough with her fingers. They’re on their way to making the kitchen a proving ground for their own culinary adventures. Hopefully you’ll be invited to taste-test while you relax for a change. Parking the kids in front of the TV while we dash to get dinner ready may be efficient, but it’s not the way young people have matured throughout human history. Children need to watch, imitate, and gain useful skills. They’re drawn to see how their elders handle a crisis, fix a car, create a soufflé, build a bookshelf, heal what’s broken, and fall in love. So welcome your little ones into the kitchen. And let the cooking begin. This article has been edited from a previous version published at Culinate.com. This was a great reminder that kids can (and love) to do just about anything we parents do! And I love the tips. Grating cheese, tearing lettuce… those are all great things for a toddler to do. I often don’t let Baby T help out because I don’t know what he’s capable of. I need to remember that messes can be cleaned up and dinner doesn’t have to be perfect. Love this! Sasha loves to add any ingredient she can and she puts spaghetti noodles into a glass for me. (I break them in half and put them in a glass while waiting for the water to boil.) She is only 2 now, but I look forward to more help and learning in the kitchen! Fantastic article, I couldn’t agree with you more. What a gift we give our children when we will SLOW DOWN to their pace and involve them in daily life activities. The practice and learning is invaluable! Thank you so much for this article. I believe in the importance of having kids in the kitchen, but without really knowing ‘why’. This has highlighted so many good reasons! The point about even involving newborns is very interesting 🙂 Will be saving this article for future reference. I love this piece! I totally agree and would add that a child’s place is in the garden, too. My son, a very picky eater, helped plant and then harvest radishes. Guess who was first to chomp through them? Him, of course–though I doubt he’d have touched them if he hadn’t been so involved in their life. Cooking can do much the same thing!